Every effort is made to bring our dogs to the listed event each week, but due to volunteer or foster commitments Rodeo may not be at every event. To find out if Rodeo will be at this event, contact Meg. 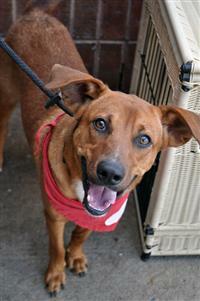 Rodeo is a fun-loving boy mixed with a sweet, affectionate side! He is ready to go wherever and doesn't mind exploring the outdoors. Are you looking for a new adventure buddy?? ?